Notes: I was immediately drawn to the sheer brilliance of this design: a pullover sweater you can wear upside down! The description says you can also wear it inside out, but I think that’s hard to do because of yarn ends that need to be woven in and the seam around the armhole. Of course, if you’re using a yarn that you can spit-spliced and if you don’t mind exposed seams, you could pull it off. Even then, though, the shaping in the ribbing doesn’t look as good on the other side. Either way, it’s still a cool concept. I substituted a yarn with a different gauge (8st/4” instead of 6st/4”), so I had to cast on 60sts to get the size I needed. If you are casting on a different number of stitches too, remember to use a multiple of 4. 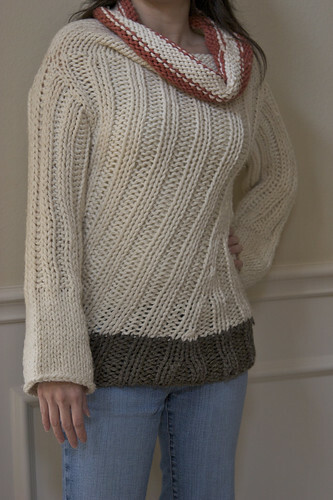 If you look at the picture in the book, it looks like the rib shaping should begin in the middle of the sweater. However, if you follow the instructions, you’ll be starting the shaping off to one side for all sizes but the largest. I wanted mine to start in the middle, so that’s what I did. For the ribbing increases where you add knit stitches, I didn’t like the results the pattern gave me. Instead, I did a KLL followed by a M1L. I do like the “dashed line” effect that the yarn color change creates with the stripes at the “top” of the sweater, but not the intermittent lines that develop when the color change is done over ribbing at the “bottom” of the sweater. So for the 1st row of the MC, I did stockinette and then returned to ribbing for the 2nd row. Oh, and you might want to remember to use your favorite jogless stripe method here--at this gauge, the jog is pretty noticeable, IMO. I made the “bottom” section only 16” instead of 18”. For the sleeves, I picked up from the armholes and knit them in the round, from the top down. If you choose to do that too, remember to pick up a multiple of 4 sts. If you are following the directions as written, they are a bit vague in that you are supposed to do k2p2 rib but are told to cast on an odd number of stitches. I suppose the best way is to do k2p2 rib and end with a k1 for your spare stitch, and then use a mattress stitch to seam up the sleeve, taking it in 1/2 st on either side instead of the usual 1 st. This avoids extra bulk and gives the illusion of continuous k2p2 ribbing. This yarn is very soft and comfy, but I had 2 major problems. First, it fuzzes like mad. This was the first sweater I’ve ever made that I had to shave before I ever wore it. Second, the red color bled onto the adjacent cream color. Thankfully it’s not so obvious on the reverse side, so I will probably wear it with the red stripes in the neck. 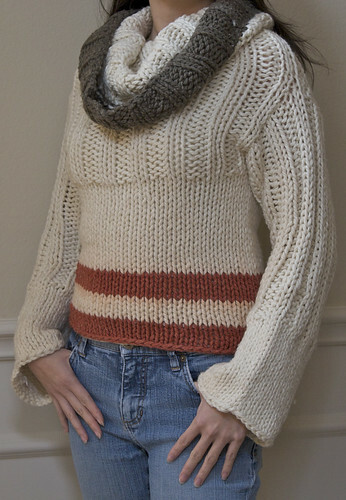 I might frog the red stripes and reknit the stripes in a different color or as solid cream instead.